In its broadest sense, Dharma stands for the most subtle, fundamental law underlying the universe, well-known to sages and seers. Indeed, it is by trimming their sails to this law that they have discovered the way which, as the Upanishads say, ‘carries one beyond sorrow’—the way which is called Yoga. Increasing our knowledge of the natural laws governing the universe, we have been able to make great strides in civilization, and are no longer entirely at the mercy of natural forces. We cannot change them, but we can learn to react to them wisely, so that they help us rather than cause us to suffer. It is the same with the fundamental law, the spiritual law of dharma, which affects every aspect of our lives. We cannot change it or go outside it, and must therefore experience the consequences of our actions within it. But this is not a restriction. It is a means of freedom, for this law is benevolent, a divine law of love, which works for the highest good of all. When we begin to understand its operation and consciously work in harmony with it, real progress in life begins. There is a law which keeps all the little bits of the cosmos in their proper places, obeying which every individual and every object is related to any other in a certain specific way. This law is called dharma… The greatest gift of ancient India to the world is the knowledge of this word dharma—regulator of harmony between man and man, man and beast, and nature and man. Love is but one manifestation of this law, and beauty in any form, whether in music, rhythm or architecture, is also a manifestation of this law of dharma, which postulates one great force running in and through all men, creatures and objects… To recognize and apprehend this law is the first duty of every human being. The right response of the individual towards this law of cosmic harmony is also called dharma, in the sense of righteousness. It is not an ethical code, imposed from without, but an inner prompting from our own universal spiritual being, which, when followed, leads onwards towards spiritual awakening. To violate it by harming others, who are aspects of our own being, or by condoning wrong without a protest, is to make a reality out of outer appearances, and will inevitably recoil on ourselves and bring suffering in the long run. All the upheavals and conflicts in the world are caused because people contravene the law of dharma. How much the world needs this message today. It is easy to feel that what we as individuals do or think in private—our secret animosities, dishonesties, acts of moral cowardice and so on—has no far-reaching implications on our state of mind. Sometimes, we may insist, it is necessary to make a compromise with truth in order to survive. After all, we can do more good alive than dead, can’t we? Sometimes lies can only be countered by lies, evil by evil. The answer to all this is that anything which basically violates the law of dharma, can in no way promote good either to the individual or to society. Appearances may seem to contradict this, but this is only a short-term view. The ripples of disharmony proceeding both inwards and outwards from non-dharmic action may be great or small, according to the degree of the violation of law, but they are certain and inevitable. It is sometimes said that the end justifies the means. But it is a self-contradiction to try to reach a worthy end through an unworthy means; the workings of dharma are subtle but unfailing, and the original end will be distorted in the process. Gross violations of the law of dharma will produce powerful adverse reactions both on the environment, and perhaps even more so, especially if concealed within one’s own heart, on oneself. The ancient sages taught that there are four main values to be pursued in life. The first is dharma itself. Living in accordance with the law of cosmic harmony means negation of all narrowness, antipathy and exclusive self-interest. It is the foundation of the good life. The second value is the pursuit of economic prosperity in accordance with dharma, sharing what we have with others and with those in need. One can only experience real prosperity on the basis of dharma; other-wise, one is a prey to care and anxiety. The third value is the pursuit of pleasure and joy, again in accordance with dharma. The ancient teachers were not killjoys, but they taught that we should pursue those joys which exalt the soul, not those which degrade it. This may include the joys of friendship, music, poetry, nature, the pursuit of knowledge for its own sake, the apprec-iation of beauty in any form—the criterion being that it is free from selfishness and uplifts the soul. All seek joy through love, but we have to learn how to love without self-interest—to be a giver and a carer, whose love goes beyond infatuation with appearances. Then love expands, because it is intrinsic-ally love of the infinite. Love which is rooted in the law of dharma leads to universalization of consciousness. Love is not complete until it is love of the supreme reality—the inner essence of every living being, ultimately to be realized as transcendent and one-without-a-second. This brings us to the fourth and highest value of life—the quest for Moksha or liberation. This is our endeavour to discover the immortal, infinite essence of our own being. All lesser ideals are fulfilled in it: all joy, all prosperity, all dharma. All joy. 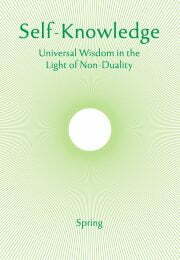 Knowers of ultimate truth view the ups and downs of life as inevitable conditions of the phenomenal world, and, though these changes register on the senses and mind of the illumined, they are received in equanimity, and never mar their identification with the reality as Self—all-pervading and invulnerable. All prosperity. The sage may appear poor in possessions, yet all needs are supplied without anxiety, in the spirit of the Bhagavad Gita verse: ‘Those who meditate on Me as non-separate—I provide what they need and protect what they have.’ Knowing one’s Self to be the Self of all, no illusory desires can interfere with the peace and spiritual prosperity of enlightenment. All dharma. The very being of the sage is the perfection of the law of cosmic harmony. The illumined ones are ever engaged in furthering the good of all living beings, whether they are still or active, silent or expressive. Their presence purifies, harmonizes and uplifts those in their proximity, and on the invisible plane their universalized consciousness has a cosmic efficacy for good. So we see how dharma is the beginning and also fruition of the yogic life. Unless the foundations are well-established and sustained, the building will fall and never be completed. But with right resolve the great edifice of a spiritualized character can be constructed anew at any time. In the Gita it is said that the unrighteous, if they strive to reform and one-pointedly fix their heart on Me—the Lord, are to be accounted righteous, because soon they will become so, and are led to the ultimate good. This is the highest dharma—to fix one’s mind on the supreme reality, either in the personal form or on the formless pure being-consciousness-bliss, with the aid of the discipline called yoga. Dharma is thus the cosmic law of harmony and a manifestation of the one Lord pervading the whole universe, present as our own being—our deepest and innermost Self. Through this law we are prompted to discover our ultimate identity with infinite reality, in freedom and joy. When we follow the law, we draw nearer to our reality. When we concentrate on That as the only reality, we fulfil the law. We realize that the inner essence of God and man is one and the same, and that the world is a phenomenal appearance within that self-illumined reality. This article is from the Spring 2016 issue of Self-Knowledge Journal.